The light blue is really attractive for no matter kids or adults. It is wave shape which is also a classic design. For the other sides, we can make the printing as your request to decorate the large inflatabel slide, we use digital printing for large artworks. The 1000D pvc tarps is one of the strongest material in the world and it is what we use for the giant commercial inflatable slide. 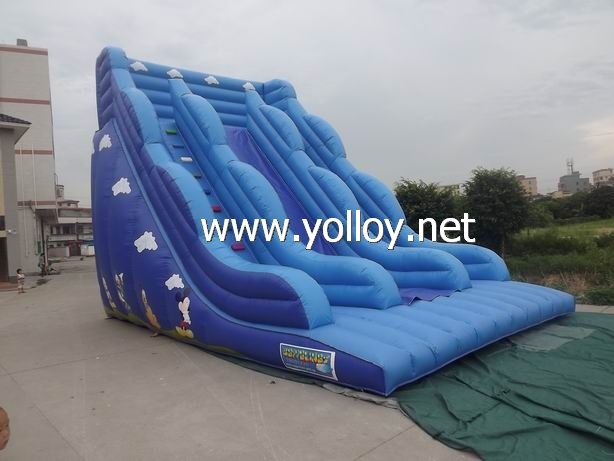 We produce the inflatable slide according to the standard of EN14960. which is the strict Eurppean standard for inflatable games. Our inflatable slide can be used for more than 3 years if you use it in the correct way.